I have been a Christian for over 25 years, studied the Bible and have been fully committed to following what the Bible taught, with a limited amount of success. There was always an underlying frustration that I did not see the transformation in peoples’ lives that the Bible led me to expect, and I saw very little of the signs and wonders that Jesus promised would follow those who believed. Surely Jesus promised “life in abundance” (John 10 verse 10) NOW, not “pie in the sky when we die”! During this last year I got involved with a group of Christians who prayed for people on the streets. But first this required talking to people, mostly non-Christians, about Jesus, about God. This was a scary challenge to me since they don’t understand our church jargon. As I simply told people how much God loved them, a surprising thing started to happen to me. What I was telling others started to hit home in my heart – God really loved ME! I had known this in my mind and could quote appropriate scriptures, but I now realised that my heart hadn’t fully got the message until now. I now feel such a joy inside, which had not been there before. The frustrations I had experienced with people have somehow been exchanged for compassion and apprec-iation. So, this is why Psalm 16 verse 11 says “in His presence is fullness of joy”. 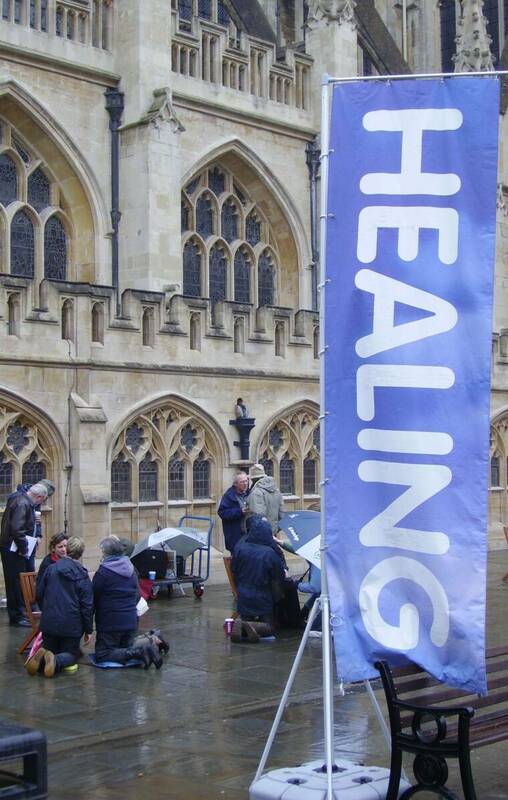 Come and see us, as HOTS Bath is back on the streets every Tuesday and Thursday starting 5th of March. ​​Host a training school equipping you to bring others into an encounter with God and see the sick healed in your Church, Cafe, outreach ? – download the flyer here. Pray for us as we go out on the streets, for the ongoing Mission trips, and for the equipping we carry out. ​Support the work financially through monthly giving, you can download a form here. This report is most encouraging because a year ago, within three months of this blog’s debut, a political ruling prohibited prayers for healing in public places. Consequently, my wife and I contacted Paul about including her testimony of healing on the HOTS Bath website. This was because she’d received her healing from permanent disability in that city before the days of HOTS. I’ve since supported and promoted his campaign against the Advertising Standards Authority (ASA) and which attracted Parliamentary interest. An official review found a substantial flaw in the ruling, as reported here. An unexpected outcome to Paul’s publication was that an investigative journalist came to our house – an expert in exposing bogus claimants of the Disability Living Allowance! That is, some fully fit and able people use counterfeit permits and fraudulently receive the state allowance. He was fully expecting to see a permit on our car but didn’t – he was quite perplexed! So we invited him in. Over ‘a cuppa’ we told him the full story and Nina showed him the documentation. Regrettably, the journalist didn’t get back to us. Did his editor squash his story? Therefore, I contacted the lady who’d made the original complaint to the ASA and gave her the reporter’s opinion of the incontestable facts. Although supposing herself to be an investigator of the supernatural, she hadn’t the slightest interest in our evidence or pleasure to learn about the healing. She thereby denied its truth and demonstrated her complete lack of integrity – a fraud herself. But what else can an atheist do? 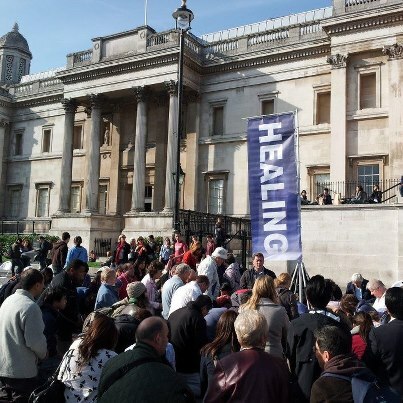 To learn about our training day with Mark Marx, the founder of Healing On The Streets, and activity in Trafalgar Square click here. This entry was posted in Healing, UK and tagged HOTS, Testimonies by Richard Barker. Bookmark the permalink. Thank you so much for your encouragement Kenny. Bless you. Yes I’d taken my ‘fix’ just after posting and whilst chatting with a friend I’m helping to move into freedom. It was a good job that the copy and draft had been done y/day as a family emergency blew up this morning – but we stopped for a coffee! Have just added link to video of Lasette with whom Nina chatted about their most marvellous healings – thank you Lord.